It's been more than 20 years since the Audubon Zoo underwent a total renovation that turned it from one of the worst zoos in the country into one of the best. The achievement is still worth noting, and the result is a place of justifiable civic pride that delights even non-zoo fans. While a terrific destination for visitors with children, this small and sweet attraction offers a good change of pace for anyone. Note that on hot and humid days, you should plan your visit for early or late in the day; otherwise, the animals will be sleeping off the heat. Here, in a setting of subtropical plants, waterfalls, and lagoons, some 1,800 animals (including rare and endangered species) live in natural habitats rather than cages. Don't miss the replica of a Louisiana swamp (complete with a rare white gator) or the "Butterflies in Flight" exhibit, where more than 1,000 butterflies live among lush, colorful vegetation. A memorable way to visit the zoo is to arrive on the stern-wheeler John James Audubon and depart on the St. Charles Avenue streetcar. You can reach the streetcar by walking through Audubon Park or by taking the free shuttle bus. During your visit to the zoo, look for the bronze statue of naturalist John James Audubon standing in a grove of trees with a notebook and pencil in hand. Also, look for a funny-looking mound near the river -- it was constructed so that the children of this flatland city could see what a hill looked like. Located on the Mississippi River bank in scenic Woldenberg Riverfront Park, the Aquarium of the Americas hosts daily "expeditions" into the major aquatic habitats of North and South America: the Caribbean Sea, the Amazon Rainforest, the Mississippi River and the Gulf of Mexico. The acclaimed animal collection includes thousands of fish, reptiles and birds, including many creatures native to Louisiana waters, from rare paddlefish and swamp-dwelling alligators, to Gulf sea turtles that are among the world's most critically endangered animals. Each exhibit closely mirrors the beauty and diversity of wild habitats, and opportunities for hands-on fun abound, from shark petting to stage shows. Often called NOMA, this museum is located in an idyllic section of City Park. The front portion of the museum is the original large, imposing neoclassical building ("sufficiently modified to give a subtropical appearance," said the architect Samuel Marx); the rear portion is a striking contrast of curves and contemporary styles. The museum opened in 1911 after a gift to the City Park Commission from Isaac Delgado, a sugar broker and Jamaican immigrant. Today it houses a 40,000-piece collection including pre-Columbian and Native American ethnographic art; 16th- through 20th-century European paintings, drawings, sculptures, and prints; early American art; Asian art; and one of the six largest decorative glass collections in the United States. The changing exhibits frequently have regional resonance, such as the extensive retrospective on Degas, which focused on the time he spent in the city, or the one devoted to religious art and objects collected from local churches. Another exhibit focused on -- how's this for a complete change of pace -- "dirty pictures" throughout the modern era! This past year, the museum opened the Besthoff Sculpture Garden, 5 acres of gardens, grass, and walkways that spotlight 50 modern sculptures by artists such as Henry Moore, Gaston Lachaise, Elizabeth Frink, George Segal, and others. It's quickly become a New Orleans cultural highlight and is open Tuesday to Sunday 10am to 5pm, with free admission. The Cabildo was the site of the Louisiana Purchase Transfer and was the seat of the Spanish municipal government in New Orleans. The Cabildo provides a comprehensive exhibit focusing on Louisiana's early history through to Reconstruction. Also part of the Louisiana State Museum system is the Presbytere. The Presbytere was then used by the city as a courthouse until 1911 when it became part of the Louisiana State Museum. It now houses a behind the scenes look at Mardi Gras in Louisiana. The Old U.S. Mint, the only building in America to have served both as a U.S. and Confederate Mint, now houses exhibits on Newcomb Pottery and New Orleans Jazz. The 1850 House recreates what a residence would have looked like during the Antebellum era. Faithfully furnished with domestic goods and decorative arts of the period, the 1850 House depicts middle class family life during this era. Those who have been to Disneyland might be forgiven if they experience some déjà vu upon first seeing the French Quarter. It's somewhat more worn, of course, and, in spots, a whole lot smellier. But it's also real. However, thanks perhaps in part to Disney, many tourists treat the Quarter like a theme park, going from bar to bar instead of ride to ride, broadcasting their every move with rowdy shrieks of merriment. A French engineer named Adrien de Pauger laid out the Quarter in 1718, and today it's a great anomaly in America. Almost all other American cities have torn down or gutted their historic centers, but thanks to a strict preservation policy, the area looks exactly as it always has and is still the center of town. Aside from Bourbon Street, you will find the most bustling activity at Jackson Square, where musicians, artists, fortunetellers, jugglers, and those peculiar "living statue" performance artists (a step below mime, and that's pretty pathetic) gather to sell their wares or entertain for change. Royal Street is home to numerous pricey antiques shops, with other interesting stores on Chartres and Decatur streets and the cross streets between. The closer you get to Esplanade Avenue and toward Rampart Street, the more residential the Quarter becomes, and buildings are entirely homes (in the business sections, the ground floors are commercial and the stories above apartments). Walk through these areas, and peep in through any open gate; surprises await in the form of graceful brick and flagstone-lined courtyards filled with foliage and bubbling fountains. The Vieux Carré Commission is ever vigilant about balancing contemporary economic interests in the Quarter with concerns for historic preservation. Not only has the commission encouraged restoration, but it has also joined in the battle to hold back certain would-be intruders of the modern world. There's not a traffic light in the whole of the French Quarter -- they're relegated to fringe streets -- and streetlights are of the old gaslight style. In 1996 large city buses were banned from the neighborhood. During a good part of each day, Royal and Bourbon streets are pedestrian malls, and no vehicles are ever allowed in the area around Jackson Square. We also applaud the hard-drawn lines that have mostly kept out the generic chain stores that populate most city centers these days, threatening to turn all of America into one big mall, one city indistinguishable from any other. Though much of New Orleans is made for walking, the Quarter is particularly pedestrian-friendly. The streets are laid out in an almost perfect rectangle, so it's nearly impossible to get lost. It's also so well traveled that it is nearly always safe, particularly in the central parts. Again, as you get toward the fringes (especially near Rampart) and as night falls, you should exercise caution; stay in the more bustling parts and try not to walk alone. Museums--You might be interested in the Germaine Wells Mardi Gras Museum at 813 Bienville St., on the second floor of Arnaud's restaurant (tel. 504/523-5433; fax 504/581-7908), where you'll find a private collection of Mardi Gras costumes and ball gowns dating from around 1910 to 1960. Admission is free, and the museum is open during restaurant hours. The wonder of nature is magnified at the Entergy IMAX® Theatre, where bigger-than-life adventures illustrate the world's most advanced motion picture technology. The nation's first IMAX to be located at an Aquarium, the theater uses superior sound and in-your-face imagery to complement nature themes advanced by the Aquarium of the Americas and other Audubon Institute facilities. Coined from the words "maximum" and "image," IMAX delivers just that on a screen four times the size of conventional movie screens. Audiences are immersed in the action, from undersea explorations to jungle journeys, and mesmerized by the diversity of creatures that most never see in real life. Entertaining and educational, IMAX is an unparalleled window on the world we all share. 6600 Plaza Drive, Suite 206 New Orleans, LA 70127, General Information 1-504-242-0220. Jazzland is a 140-acre amusement park in New Orleans showcasing the unique culture of Louisiana. The high quality attractions offer 31 outstanding amusement rides, spectacular shows, scrumptious food and a variety of live music - everything that makes New Orleans a world-class destination. Targeted for completion before the start of the new millenium, the Audubon Living Science Museum is a 30,000-square-foot facility whose first phase is being devoted to the world of insects. With nearly a million known species and 3,000 new ones discovered each year, insects comprise the largest animal kingdom on Earth. With a history that dates back 350 million years, they are an intriguing group, exhibiting complex behaviors, amazing diversity, and in many cases, great beauty. 900 Convention Center Blvd, New Orleans, LA 70130. Phone: 1-504-582-3023, Fax: 1-504-582-3088. 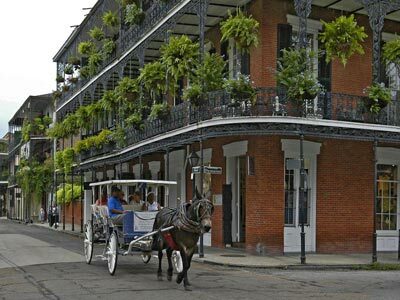 Visit the world-class Morial Convention Center, located in the heart of America's most alluring city-- along the mighty Mississippi River within walking distance of the French Quarter, Jackson Square, the Aquarium of the Americas, and dozens of first-class hotels. From hardwood forest to freshwater wetlands, this nature preserve offers easy explorations of Louisiana's unique habitats...all just minutes away from downtown New Orleans. One of the nation's most respected urban nature centers, it offers a hands-on museum, a planetarium, greenhouse, butterfly garden and miles of hiking trails. The learning adventures are also enhanced by the many native animals which often reveal themselves to those who explore this unspoiled wilderness. A welcome getaway for families in search of outdoor outings, the Nature Center also serves as a vital resource for environmental education in the Gulf South region. 1 Palm Drive, New Orleans, Louisiana, 70124-4608. Phone: 504-482-4888 - More than you'd expect - Golf, Tennis, Boating, Softball, Botanical Garden, Celebration In The Oaks, Family Fun and so much more! 1501 Girod Street, New Orleans, Louisiana 70113. Phone: 504-846-5959 - Next to the world renowned Louisiana Superdome, the newest entertainment center in the South has opened its doors and added to the world class entertainment of New Orleans. The innovative design of the arena provides for 17,000 seats for hockey games, 18,000 seats for basketball games, and 19,000 seats for center-stage events. 12301 Lake Forest Blvd, New Orleans, LA 70129, General Information 1-504-253-8100. Six Flags New Orleans, formerly Jazzland Theme Park, announces new rides and entertainment and more than $20 million in capital improvements. Visitors can ride on new roller coasters including Batman: The Ride, a sleek and powerful suspended, looping roller coaster based on the legendary DC Comics super hero, Batman. Another new roller coaster, located in the parks Mardi Gras area, will feature three wicked inversions and more than 1,900 feet of track. Phone: 800-756-7074 - Dominating the skyline of New Orleans, the Louisiana Superdome stands as a monument of the imagination. Less than a mile from the historic French Quarter, the mighty Mississippi and most of New Orleans' major hotels, the Dome is something every visitor to the city should see! Don't be fooled by the slightly more modern look -- some of the most amazing tombs in New Orleans are here. Not to be missed is the pyramid-and-Sphinx Brunswig mausoleum and the "ruined castle" Egan family tomb, not to mention the former resting place of Storyville madam Josie Arlington. (Her mortified family had her body moved when her crypt became a tourist attraction, but the tomb remains exactly the same, including the statue of a young woman knocking on the door. Legend had it that it was Josie herself, being turned away from her father's house, or a virgin being denied entrance to Josie's brothel -- she claimed never to despoil anyone. The reality is that it's just a copy of a statute Josie liked.) Ruth of Ruth's Chris Steakhouse was entombed here in 2002 in a marble edifice that looks remarkably like one of her famous pieces of beef. The museum can arrange psychic readings and visits to voodoo rituals if you want to delve deeper into the subject.